The Place Located in Joo Chiat, Jiak is a relatively new private home dining concept in a charming duplex apartment in the east of Singapore. The name Jiak is a play on dialect which means home, and there is also a resemblance in terms of pronunciation as ‘Chiat’ in Joo Chiat. The Jiak2gather concept is owned and run by Chef Anon Foo, who seeks to offer home cooked Chinese dishes in a cosy atmosphere. Chef Anon counts his culinary flair from his experience of following his grandmother in hawker centre since young, so you can expect some local hawker dishes being featured on the menu. Back to the house, it is a spacious setting where there is a long dining table in the living room which can accommodate up to a maximum of 10 pax. The Food Priced at S$70 nett for seven courses, the menu is omakase style so it was a surprise for me as to what exactly I was going to have. The meal started with the Signature Foie Gras Ngor Hiang, a modern twist to this Peranakan dish. The foie gras flavour is quite subtle, while I do find that it is overall a tad too salty. Next up is the Prime Rib Lotus Root Soup, which is quite a comforting bowl to have. The third dish was the Braised Kurobuta Pork Belly with Chinese Steamed Bun, where the pork belly is quite tender and flavourful. Another commonly seen Chinese dish, the Herbal Emperor Chicken here is a decent rendition. The chicken meat is relatively tender, though I would have preferred if the herbal element is more pronounced. The next dish is the Steamed Cod Fish in Chicken Broth, which has a very light flavour profile. It would have been better if the cod fish is paired with a more intense broth, as I find that the flavour of this dish is quite singular. The last savoury dish is a choice between the Tiger/Vannamei Prawn Dry Laksa or the Homemade Fish Otah Nasi Lemak. My table was torn between both options, though my vote goes to the Dry Laksa which is lemak enough for me. The laksa is not too spicy, but tasty enough even without any broth. 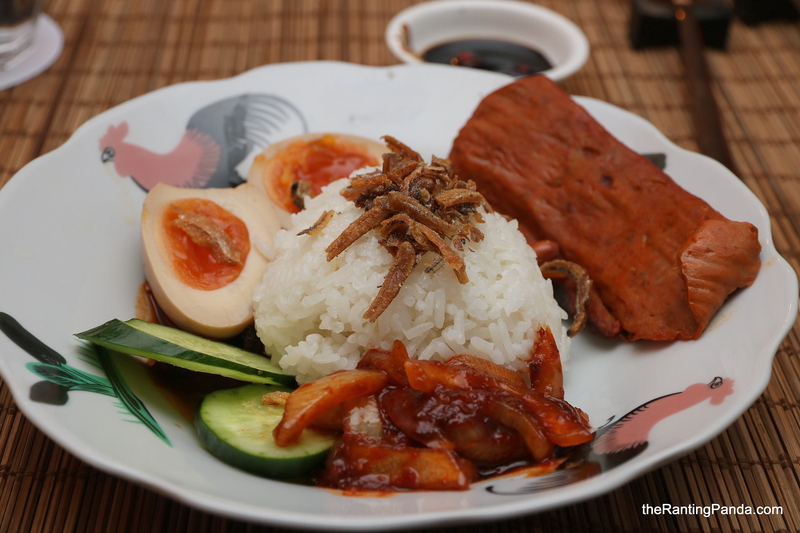 For the Nasi Lemak, the main star here is the Homemade Fish Otah which is very good. The sambal is moderately spicy, which is always good to go along with the rice. For desert, it was a simple bowl of Green Bean Soup with Coconut. Rants The flavour of the dishes in general could be more pronounced for me. That said, it might be a case of a focus on home cooked food and hence the seasoning of the dishes is not that extravagant in general. Will I Return Again? For the price, Jiak is one of the cheapest private dining option in Singapore at the moment. Try this if you have a liking for local food and would like to have a taste of how private dining is like. Make your reservations instantly at Jiak here.